Vote: Are Middle-earth: Shadow of War's new loot box microtransactions a good idea? If building an orcish army in Middle-earth: Shadow of War the old-fashioned way is too slow for you, the game will let you spend real-life money to recruit powerful followers and get useful gear. Yes, loot boxes and microtransactions are coming to Middle-earth. Developer Monolith Productions has explained how the unexpected addition to the open-world action sequel will work in a post on its forum. Shadow of War will let you use real money to buy gold, which can then be used to buy loot boxes and other virtual goods on the market. These can also be purchased with Mirian, the standard currency you earn while playing, though it sounds like there will be separate versions depending on which currency you use. War Chests: It's a box full of orcs, organized by a rarity system because this is a video game and that's how things are done. They also contain "Training Orders" that you can use to advance and customize your snarling buddies. Loot Chests: These loot boxes are all for Talion. 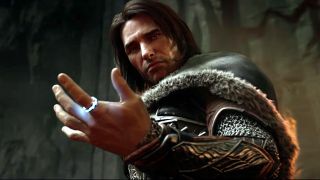 They include weapons and armor that can improve Talion's abilities, and they can also grant XP Boosts to help level him up faster. XP Boosts: You can buy XP Boosts by themselves if you just want speedier leveling. Bundles: All of the above, for less. "The game is balanced so you can play the game without using the Market," Monolith explained in another forum post, as you'll find gear and recruit new followers in the course of playing. According to Monolith, the Market goods are just there to speed up your progression. Gold will also occasionally be given out for certain achievements like reaching in-game milestones or participating in community challenges. But even with all those assurances from the developer, it's still adding a significant microtransaction system to a full-priced, single-player title and people tend to have Thoughts about things that. Read our Middle-earth: Shadow of War info article to catch up on the rest of the happenings from orc country.